1000th Blog Post Today... - A Rose Is A Rose Is A Rose! This is my thousandth post! It is so hard to believe that I have written 1000 posts at this space since May 2009. The more I think about this number, the harder it is to believe. Whether my foggy grey cells comprehend it or not (I am in Shimla which has an overcast of clouds leading to a terribly cold day, hence the fog might have settled on my grey cells too! ), but the fact is that the numbers do not lie. So, here I am with 1000 posts live on my blog. If I look back on my blogging journey, I realize that when I first started writing at this space, it was all personal. I shared my daily happenings or interests and life in general around me. And then like unexpected things that happen in our life, the unexpected and never explored before, happened on my blog too. Yes, I expanded my horizon to writing 55 Fiction, Drabbles, book reviews, photo challenges, social causes, lists, Ten on Tuesdays etc. I am glad that I forayed into diverse topics as doing the same thing again and again often leads to boredom and fatigue. I am glad that I changed the tone of my blog over a period of time and evolved its voice. Of course, all this was shaped by the readers and commenters as much as it was by me. I’d like to believe that all this change worked for me. What do you think about it? These past few days, I was reading my old posts. While some brought smiles and some revived old memories, some made me go wow! Yes, I loved what I had written! And some were totally cringe worthy too. I was like, “Gosh! Did I write this?” And such posts were not one or two but so many of them. This made me realize that on your blog you not only get a second chance, or a third… or a fourth… in fact a lot of chances to make errors, learn and grow. How wonderful is that! I’d like to take this as an opportunity to sincerely thank you, the fellow bloggers, commenters, regular /occasional readers for being with me at different points of my 1,000 posts journey. I can’t write without a reader. It’s precisely like a kiss—you can’t do it alone! Thank You for all your support and encouragement! It means a lot! I don’t know what lies ahead in between now and the next 1,000 posts. Yes, I am being too ambitious and optimistic. I have an idea of some things that will happen but then that’s the fun part – taking it as it comes. Thank you all for the first 1,000 memories – here’s to continued reading, writing, learning and growing ahead. Previous post Enjoy the Spotlight! Congrats Shilpa. That is an amazing milestone. Wishing you great success in the blogging world. This is beyond fabulous! Many congrats!! Congrats and keep writing for us. Hearty congratulations!!! Looking forward to many more!! I have watched with great interest your graduation from just a blogger to one of the best and perhaps one of international standard..May be some of us,at least me, can learn a thing or two from the standards set by you. All the best and keep blogging. That’s a stupendous achievement Shilpa! 1000 is an impressive number indeed! Kudos! It’s a great accomplishment Shilpa….Congratulations!!! Wow. .congrats on your millenary achievement! Wish you many more. .
1000 😀 😀 wow!!! To be honest I used to love love love your blog more before you forayed into the challenges!!! Not that I don’t like your blog now but I guess there was more of a personal connect then!!! Your are in a different league now, shilpa! 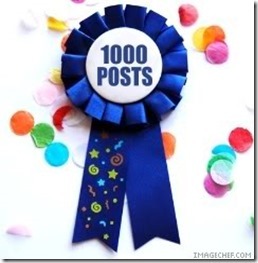 1000 post blogger club …..I am sure there are very few there. A wonderful achievement. Enjoy your journey.Congratulations!! Wow Shilpa,, this is a great achievement!I have seen your blog growing from its infan:grin:cy to its level of supremacy. Congrats a lot. Great shilpa ! so much to learn from you, glad to have visited and wish you all the very best !! Had to comment on this post. Wow. 1000! Wow. You, Me, Guria – we started blogging around the same time. Look at you and look at us 😀 It’s awesome to have known you through blogging. And I hope to see you pretty soon. Hi Neha! So good to see you here!! How have you been! Congrats Shilpa. That’s a phenomenal achievement :). Totally agree with you when you say that we get so many chances to improve what we write on a blog as we go on and our readers shape our posts and ideas. Wish you all the success for the next 1000 posts and beyond :D.